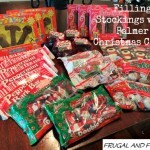 If you are wanting to give your SWEET HEART a Homemade Dessert this year, here is an easy DIY candy. I happened to pick up Craisins Buy One Get One Free and was excited to put them to good use in a yummy recipe. 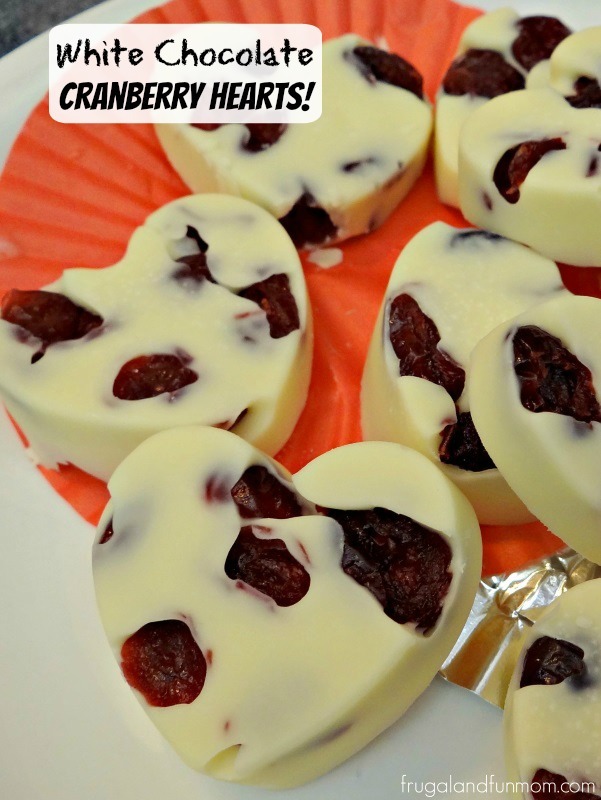 I had seen heart molds at Walmart and thought why not combine two of my favorite things, White Chocolate and Dried Cranberries. All you need to make this is a package of White Chocolate for baking, dried cranberries, and a heart-shaped mold. The 4oz package of white chocolate makes around 10 of these. (Next time I am getting the larger box.) 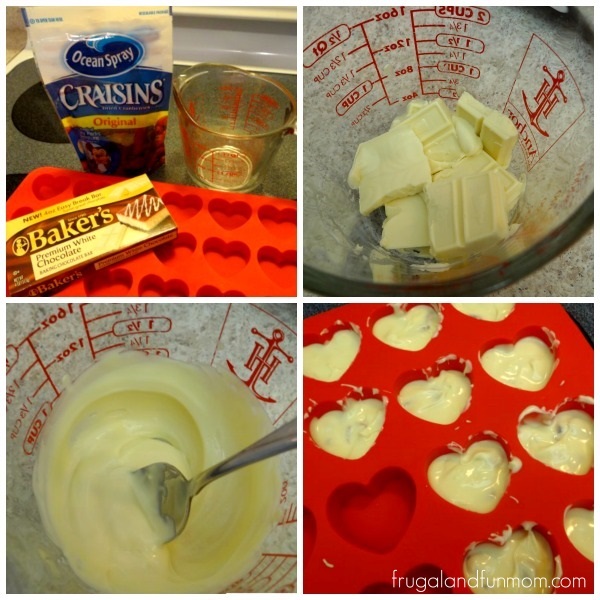 If you don’t have a heart-shaped mold, you can use any shape or try small cupcake baking cups. Pour enough chocolate into each mold to cover the cranberries. Place this in the refrigerator for at least 30 minutes. 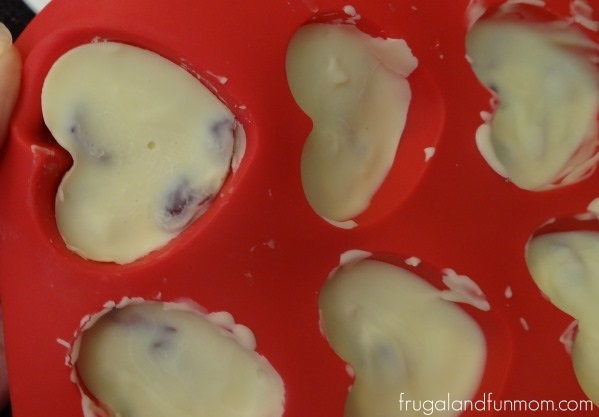 Once it is completely set, you can push the chocolate hearts out of the mold, flip them over, and that is it. Feel free to shave off any excess chocolate with a butter knife. I think these would be perfect for a tea party, shower dessert, or wedding place setting. If you are looking for a way to gift these for Valentine’s Day or an Anniversary, layer wax paper in a box with 2 to 3 hearts on each layer. These are so pretty and super sweet, I could only eat one heart at each sitting. They taste so good! Do you make a variation of this dessert? What is your favorite dish to use dried cranberries in? If you try making these, let me know how it goes. 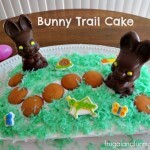 Bunny Trail Cake Made With Palmer Chocolate Easter Candy and a Cotton Tail! What a great idea. These look so good. I just bought some little heart shapes, too!! So simple and easy! What a delicious treat to make for someone. I love this as part of a gift and want to try this. I would pair it with a few other small but meaningful items and help eat the chocolate! they're just as pretty as can be, I'm going to pin them. Cranberries are such a fave of mine, I love that little juicy burst of flavor they offer up. These are so cute, my mom loves cranberries! She loves to put them in her salads! I should make her some for Valentine's Day! Love these, so cute! Bet they taste amazing, too! Yum! I think these would be a perfect dessert to let my daughters make because it sounds simple and doesn't have a ton of ingredients. Thanks for sharing it. Those are so cute, Carlee, and so simple. ICranberries are some of my favorites anyway and mixed with chocolate, yum! Now that sounds yummy and I love that cranberries are a part of this recipe. What a great project for me to try for Valentines Day. These are so pretty. 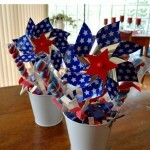 They would go well with the chocolate covered fruit platter that I am working on.